Susan Lemesis and Dianne Cannestra stand with David Carmicheal, state archivist, holding the Appling sword, which was awarded to native son Daniel Appling for heroism. The deal went down clandestinely in broad daylight in the heart of downtown CharlotteIt wasn’t illegal, but the parking lot arms swap was done surreptitiously because the item involved is worth upward of $100,000 and “absolutely priceless” to Georgia history..The War of 1812 sword, awarded by the General Assembly to native son Daniel Appling for heroism, finally has been brought home to the Georgia Archives by Dianne Cannestra, president of the Friends of Georgia Archives and History, a nonprofit fundraising group, and Susan Lemesis, co-chair of the Appling Sword Campaign.It had been lost since 1907 but was found by a fluke in 2010 by a former archivist while thumbing through Antiques magazine in a barbership. He reported the discovery to state archivist David Carmicheal, who enlisted the aid of FOGAH to help raise enough funds in a weak economy to purchase it from its owner, dealer Kelly Kinzle of New Oxford, Pa.
Appling led a small band of riflemen who defeated a large force of British soldiers in the Battle of Sandy Creek in New York on May 29, 1814.The Legislature honored him in 1814, voting to present “an elegant sword” for his “cool and deliberate valor.” But Applingdied before the blade was presented and it became state property.The state loaned it out for inclusion in Georgia’s 1907 exhibit at the 300th anniversary of the founding of Jamestown, but then it vanished. The Georgia attorney general’s office determined the owner had no obligation to return it. That’s when Cannestra, Lemesis and 100 or so other volunteers went to work, holding fundraisers and finally accumulating the asking price. Carmicheal says the sword now rests in a high security vault, and plans are to turn it over to the state, then move it to the Hall of Valor in the Capitol, hopefully before the 200th anniversary in June of the start of the war. Gov. Nathan Deal’s office says he will accept it in a ceremony in the next few months. “The sword is special,” Lemesis says. “Now we need to raise more money for restoration and a plaque and box for the Capitol. NEW YORK DAUGHTERS RECEIVE NATIONAL ENDOWMENT FOR THE HUMANTIES GRANT-ARE TO HOST A PROGRAM IN JUNE. 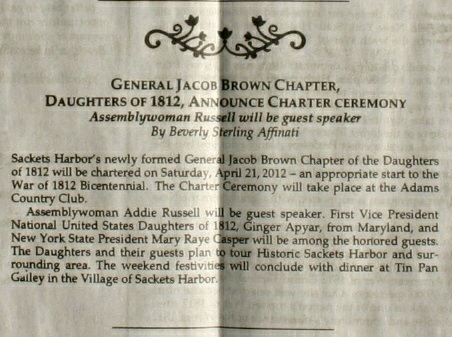 Mary Raye Casper, President of the New York Society U.S. Daughters of 1812 New York Society, received a Speakers in Humanities Grant and will host Matthew Kirk’s lecture "Archeology and the Second Battle of Sackets Harbor: Why the Militia Deserves Its Due," on Thursday, June 7, 2012 at 7:00 pm at the Northern Onondaga County Public Library. See For more information. In tandem with the opening of the new Fort McHenry Visitors Center, the Maryland War of 1812 Bicentennial Commission announced the launch of a $25 million campaign to fund the events commemorating the 200th. anniversary of the Star Spangled Banner and Maryland's role in the War of 1812.. The commission which includes the state of Virginia and the District of Columbia was begun fundraising. The Star-Spangled Banner Commemorative Coin Act which was passed into law on August 16, 2010 authorizes the sale of 8.5 million dollars of coins. The proceeds of monies gained from coin sales that will begin in January 2012 are to be available on a one to one matching basis and are to be used for bicentennial events and legacy projects.